Window shades offer solutions to many over looked issues, such as; strain on eyes, warm areas in your work environment as the sun changes position, stray light making presentations difficult to view and blinding eyes of presenters, privacy, glare, and the realization that heat in your space is driving up energy costs. With the touch of a button on your integrated control system, all automated window shades can be raised or lowered to whatever level you wish. Our window shades have a wide variety of light filtering options to fit your needs. You may want to cut down on some glare but still be able to enjoy the view outside, or you may wish to enjoy that view but have the ability to complete blackout for a presentation, or anywhere in-between. The options are endless. Increasing the comfort in a work environment has proven to increase productivity. 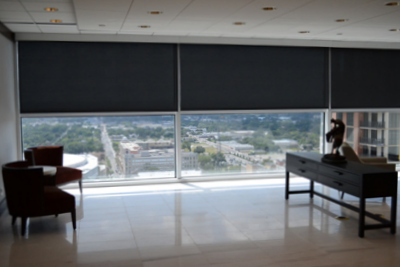 Whatever the goals & expectations are for your shades, our power window shade experts will be able to customize a system to not only meet the rooms functional needs it will be easily controlled, nearly silent and extremely ascetically pleasing.